With its perfect location, the mid-rise condominium Waterfront on Venice Island should easily make the grade as a Venice landmark. Comprised of three eight-story buildings, this condominium occupies the first block on the northeastern corner of Tampa Avenue East and the Tamiami Trail just after the bridge serving as the northern gateway to Venice Island. The development of this property is likewise a signpost to the shifting fortunes of Venice condos for sale. Developed from 2004 to 2007, Waterfront on Venice Island along with another midrise condo—Beleza on Venice Beach—came as the last local condominium construction project immediately prior to the U.S. housing downturn which triggered the Great Recession. A prominent local developer, Mike Miller, is behind the establishment of Waterfront on Venice Island. Notably, Miller has an extensive handprint on the Sarasota real estate market, with the projects he has completed not only in Venice but also in Englewood and in Palmetto. His past Venice projects include the Waterford Golf Course and its residential community. Additionally, he also developed Pinebrook Preserve, Casa di Amici, Magnolia Park and more recently, the Che Vista. All in all, Miller’s developments added more than 2,000 Venice area homes since the development of the Waterford in 1987. Amongst these wellspring of Venice homes for sale, Waterfront on Venice Island exudes a truly distinct character. 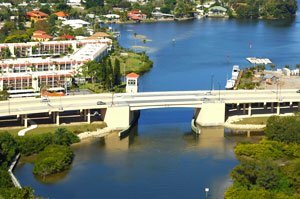 Its imposing Tampa Avenue presence just beside the Intracoastal Waterway (ICW) provides the condominium residents with spectacular water views and charming marine activities of sailing boats and occasional dolphins. 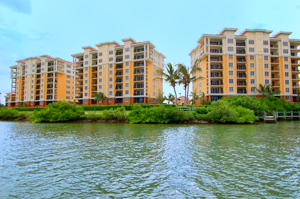 In addition to its fishing pier, this condominium likewise provides boat docks to allow residents direct access to the water. It also has a kidney-shaped community swimming pool overlooking the nearby waterway. Entry to the condominium is easy but secure via a gate code access. For the residents’ convenience, elevators serve the condos, and each unit has a designated under-building parking as well as reserved vehicle space on the grounds of the complex. The condos for sale at the Waterfront on Venice Island offer spacious living areas of between 1,700 and 2,200+ square feet. These units are typically designed with two bedrooms and two baths, with those on listings on Venice condos for sale offered at asking prices in the $400s up to the $600s. At these price points, the condos of the Waterfront on Venice Island is ideal as a seasonal residence with lease possibilities. The units of the condominium are leasable for a minimum of three months twice a year. Living in the Waterfront on Venice Island is spiced up by its proximity to local life and leisure centers, many of which are just a short walk away. Just beside the condominium is Hamilton Square which has a salon, dance studio and pharmacy among other tenants. Even more delightful, the Venetian Waterway Park and its extensive trail stretch only a few steps east of the condominium’s eastern perimeter. 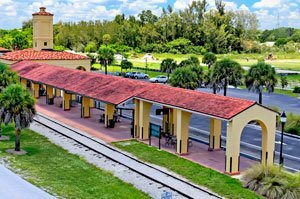 Also to the east across the ICW, the local points of interest extends to the showcase of the historic Venice Train Depot and the trail head of the 10-mile long Legacy Trail extending north all the way to Sarasota. More lifestyle activities could be had too just a short distance west of the condominium via Venice Avenue a block south of Tampa Avenue. This main road corridor leads westward to the historic Venice downtown and the island’s beaches which in so many ways have helped drive home buyers to the Waterfront on Venice Island. Below are the current real estate listings available at Waterfront on Venice Island.